Two-tone style that's ready for any weather: this hooded raincoat from Jones New York is the perfect balance of chic practicality. Protect yourself from the elements with this sleek raincoat from Jones New York. Keep your favorite outfit dry with the chic, relaxed style of this hooded raincoat from Jones New York. Stay dry no matter what the forecast has in store with this classic plus size raincoat from Jones New York. Stay dry all day in the cool, classic appeal of this plus size raincoat from Jones New York. Sleek and sophisticated, this hooded raincoat from Jones New York keeps you looking your best no matter what the weather is. Don't stay stuck indoors on drizzly days! Jones New York's colorblocked raincoat keeps you dry in style. A unique wing collar gives this water-resistant raincoat from Jones New York a sophisticated flair. 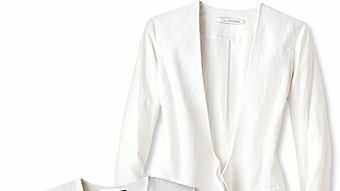 Chic contrast panels are the perfect finishing touch for the relaxed style of this raincoat from Jones New York.